Type: Scribble. Illustrations: scans of slides of mixed media paintings created by me and printed with an Epson Stylus Color 800 Printer. Text paper: Environment Writing 'Heavenly Blue.' Painting captions: written with Prisma Micron marker on tonr Japanese paper. 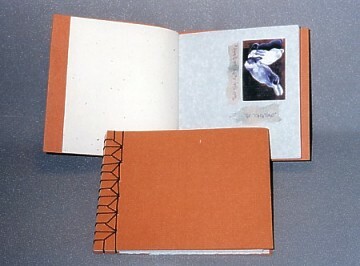 Book 5″ x 4-3/8″ (12.7cm x 11.1cm).